By TAMAR NEUMANN: When you walk into the mainstage area for Mixed Blood Theatre’s new production The Sun Serpent, you might be immediately struck by the simple, yet elaborate set design. It looks like a jungle. It sounds like a jungle, and if you hadn’t just walked in from the Minnesota tundra, it might even feel like a jungle. But that’s not why the set design is so magical. As the play begins, the scene, through projections on screens, is transformed into a sun-drenched village in Mexico. From there it changes to the seashore, and then to an underwater fishing expedition, and then to the royal court many miles inland. There are probably close to 50 scene changes in this short 75 minute play. They are rapid, and beautiful. Each one is filled with vibrant colors depicting a specific time and place in the play. And each change helps to complete the operatic styling of the show. Each color and projection helps take you a step closer to the world being examined in this play. Carey Wong, the scenic designer, and her entire team, deserve full credit for taking the space inside an old fire house and transforming it into a pre-conquered Mexico. Without Wong’s creative set, and the vision of Rachel Bowditch, the director, this show would not have been so successful. The play, written by Jose Cruz Gonzelez, is about a young boy in Mexico, played by Adrian Hernandez, who witnesses the arrival of the conquistador Hernan Cortes. His brother, played by Andres Alcala, chooses to join Cortes in conquering the Aztecs. Since this is a story of conquest, there is bloodshed and loss. The brothers are forced to choose between the new world and old. The performance is in both English and Spanish. The actors change languages during and between scenes, and subtitles are available in both languages above the stage. The story is emotional, but not necessarily anything earth shattering. Most of us aware of the horrible actions by the conquistadors, and there are predictable moments throughout. Nonetheless, it is still an important story that should be told. What makes this particular version of the story different is the decision to tell it in both English and Spanish. While some people might find it annoying to read subtitles for half of the play (and to be lost during the one short scene in Spanish with no subtitles), telling it in another language would do a disservice to the culture this play is trying to represent. Simply put, a language helps define a culture; you cannot have the same experience with a culture when you try to experience it in another language. Hearing the richness of the language while this story is being told helps deepen the experience you are having with the actors, and, in some ways, deepens the loss you feel at the end when you think about everything that was cast aside as the Americas were colonized. This loss is emphasized through the elaborate costumes and masks worn by the small cast. The three actors, Hernandez, Alcala, and Andrea Morales, play over 30 parts. 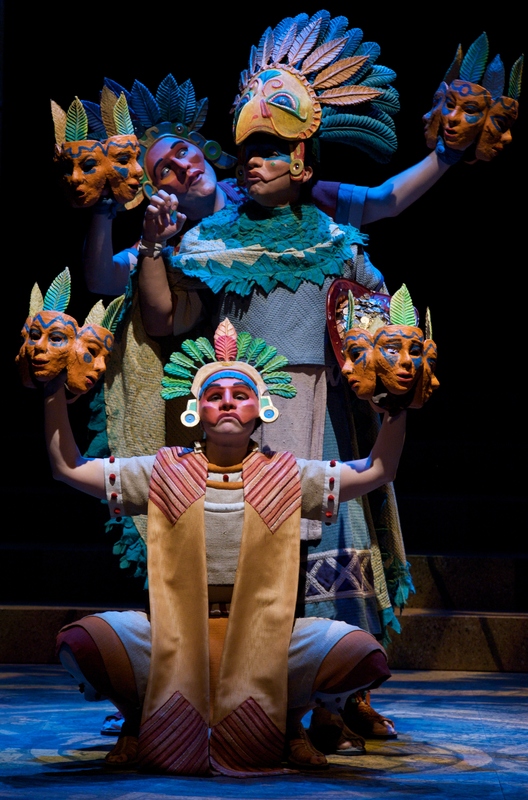 Each part is distinguished by the different masks and costumes worn by each role. In fact, the masks do such a great job of creating a new character (along with the actor playing each character) that my husband kept waiting for more actors to come out for curtain call. He was surprised to find out there had been only three. But the masks are more than just a clever way to create more characters. They represent a culture and they do it in a way that is respectful and artistic. Zarco Guerrero, the mask designer, deserves to be commended for making the stage feel full when there were only one, or two, or sometimes three actors on it. During one particular scene, the masks represent different members of a small village burned to the ground by Cortes and his men. There were only two actors giving voice to the people of that village, but the masks gave each villager a unique identity. They represent the small pieces left of the Aztec empire—the artifacts and stories of the people who once lived but now are mostly gone. In the program there is an introduction to the play by the Latin Advisory Council. At the end it states, “let the visual experience entice you to discover more about Latin American history.” I second their declaration. Go see this show so that you can enjoy the colors and the beauty of Mesoamerica. And then take that enjoyment and turn it into a desire to learn more about Latin America and its history. The Sun Serpent, by Jose Cruz Gonzalez. February 28 – March 22, 2014 at the Mixed Blood Theatre, 1501 S 4th St, Minneapolis. Tickets $20 or first come first served free tickets with Radical Hospitality; purchase advanced tickets at at http://www.mixedblood.com/boxoffice or 612.338.6131. Thank you for the compliment. I hope my posts get you excited to see some theatre!